It’d be one thing if the comic focused on one person’s loss during the tragedy, but the fact that it questions the events spinning it into one big giant conspiracy comes off as insensitive and exploitative during this anniversary. Even by the end of the story, the lab tech who starts off with such strong beliefs as to what happened, questions them, which shows her as a pretty weak minded individual. And even in all of the theories it throws out, it doesn’t go too much in depth into them, instead skimming each one without exploring whether it’s plausible. It goes so far as to include the theory that this was an inside job to be used as an excuse for Neo-Cons to expand American Imperialism. The day was a tragedy, no matter what you believe the truth might be. On the 10th anniversary of it, we need to focus on those lost to terrorism and what’s come since. We were all changed, especially those who lost a loved one and this comic’s release doesn’t feel like it attempts to ask questions about the event, but throw out conspiracies without exploration of them, which feels half-assed and disgraces the memory of those lost. Instead of a reflection, we’re left with profiteering on a tragedy an act it accuses the Bush administration of doing itself. The Big Lie to me feels like a big insult. Image Comics provided Graphic Policy with an advance copy of this issue for FREE for review. I was hoping you would have a different take on The Big Lie. I don’t think the comic specifically says the Bush Administation, however it does lay out a set of facts that we have to deal with. Do you know that many 9/11 families are asking for a new investigation? 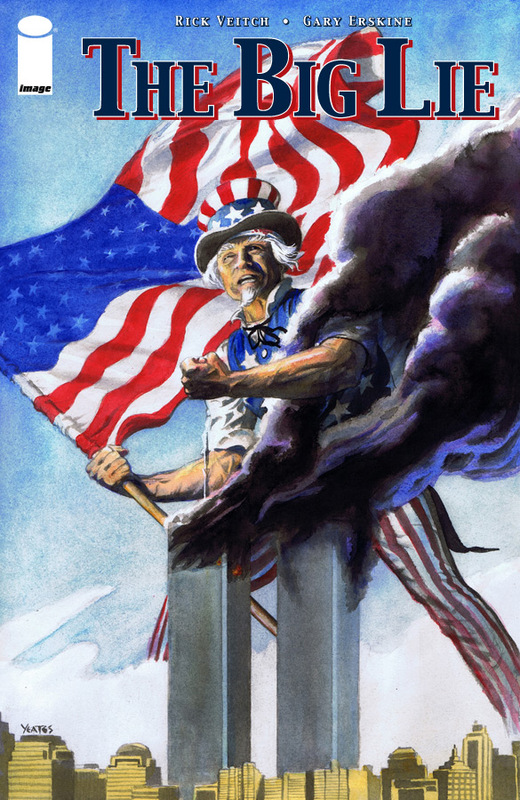 The Big Lie may be an insult to your poilitcal ideals and assumptions, but it is not an insult to 9/11 victims or families. It absolutely does accuse the Bush administration, by citing the information about PNAC. It’s not to say the administration didn’t use the attack as an excuse to implement their agenda, they did, but the comic implies that were complicit in the attack with prior knowledge. As a whole it’s shoddy writing with little “facts” given to back up it’s arguments and completely fabricates established reality. I understand there’s numerous people who are calling for new investigations, but the Truther movement has been debunked over and over again with scientific fact. It’s hard to insult my political ideals and assumptions, when the movement isn’t politically based, but instead conspiracy based so I’ll overlook that, but this comic is an absolute insult. One of the final panels that shows charges placed ignores the fact that terrorists hijacked planes intent on murdering Americans and succeeded.